In a major setback to the Gujarat government, the powerful Narmada Control Authority's (NCA's) environmental sub-group has “refused to look into” the request to close the gates, currently under installation on the Sardar Sarovar dam on river Narmada. A crucial letter by an expert with the NCA to the Government of India on lack of environmental compliance is said to have played a role. Environmentalists say, closure of the gates would take the dam's reservoir level to 138.64 metres, up from 121.92 metres, leading to “massive submergence” in the upstream. They argue, thousands of oustees still remain to be resettled, yet the agenda for the dam's closure is being pushed through. Gujarat, projected as a model state by Prime Minister Narendra Modi, wants to project the closure of the Narmada dam as a major success, as it claims it would help irrigation 18 lakh hectares (ha) parched lands of the state, apart from providing power to Madhya Pradesh and Maharashtra/ The issue is now likely to be discussed at the next NCA meet, scheduled for December. The matter was taken off agenda amidst continuing protests by the biggest anti-dam organization in the valley, Narmada Bachao Andolan (NBA), both in Delhi as also in the Narmada valley against the possibility of nearly 15,500 dam oustee families being “adversely affected” in case the gates are closed down. These families have not been counted in the resettlement list, argues NBA. 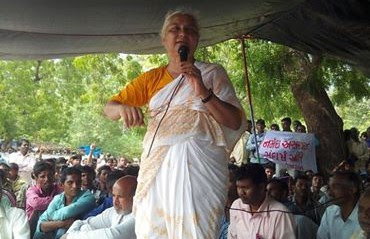 The development took place amidst a crucial meeting of NBA leader Medha Patkar and her colleagues with Union environment minister Anil Madhav Dave, where the minister was told that the gates were sought to be closed without any environmental impact assessment and ground realities. The minister assured Patkar that he would closely examine the matter before reaching a decision. Sources said, a report by Shekhar Singh, the non-government expert with the NCA, played a major role in the refusal of the NCA to discuss the gates closure. Singh is said to have written a strongly-worded letter to the the secretary, Ministry of Environment, Forests and Climate Change (MoEFCC), on why the dam's gates should not allowed to be closed as of today. “The issue was discussed in detail and the secretary MoEFCC, who is also chairman of the NCA, agreed for the need for strict compliance and the need for independently monitoring of compliance of environmental impact of the dam”, said a knowledgeable source. The letter, it is said, insisted that the conditions laid out for environmental compliance way back in June 1987, as also details laid out in the environmental sub-group guidelines, as also the Supreme Court judgments, must be complied with before allowing closure of the 30-odd gates on the dam. “These conditions include pari passu resettlement of the dam-affected families, as well as new issues emerging in the area such as sand mining, increased health impact because of the submergence, and so on”, the source pointed out. The NCA environmental sub-group meeting finally eneded after deciding that the issue of the closure of the dam's gates should be taken off agenda and, it was agreed, the points raised in Singh's letter should be thoroughly examined. The next meeting is proposed for December 2016.